Ionic air purifiers or electronic air purifiers use electric charge to separate particles of dust, dander, mold, spores, pollen, dust mites, smoke, bacteria, viruses, and other allergens out of the air. Negative charge is produced by the ionizers and causes positively charged pollutants to either clump together to become heavier so they precipitate out of the air, or the charged particles become attracted to the ionic air cleaner's charged collector plates. Electronic air cleaners or ionizers are often marketed as filterless air purifiers which appeals to consumers because of the perceived minimal upkeep and cost savings of not having to buy expensive replacement air purifier filters. 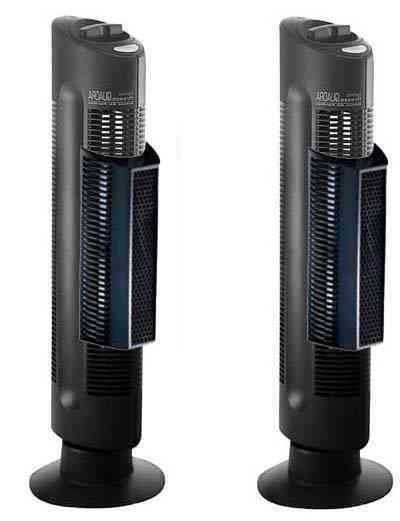 The more types of filtration the better so these filterless purifiers often have drawbacks. Read on to find out why. While electronic air cleaners may collect SOME particles from the air in the emmediate area around the purifier, they do very little for volatile organic gases and vapors (VOCs). This is a major drawback since gases like formaldehyde are very common indoors and are some of the most potent allergy triggers. Special gas-phase cartridges containing activated carbon granules or sorbents like Potassium Permanganate or Zeolite are required to absorb or trap these low molecular VOC gases. Sharp Plasmacluster FP-N60CX and some BlueAir models are exceptions which utilize an effective ionic technology known as hydroxyl radical oxidation which works on VOCs. Ashes to Ashes, Dust to Dust - Clean My Plates You Simply Must! However, there are drawbacks to the filterless air purifier since electronic charge filtration can be easily degraded as the charged coils, or plates become quickly clogged with particles. The end result is a reduction of filtration efficiency over time proportional to how dirty the ionic elements of the purifier have become. This effect happens very frequently in those ionic air purifiers that contain neither a pre-filter or HEPA filter, as many don't. Frequent cleaning of electronic air cleaners' collector plates is a common drawback and popping or sparking noises which occur when these plates need cleaning is also a common complaint of ionizers. Fire hazards could also result if proper cleaning is not done. Filterless Air Purifiers - One Trick Ponnies? Unfortunately, some of the most heavily marketed filterless air purifiers are also the least effective. These one trick ponnies often don't even contain fans, but rely on the weak air current into the ionizer produced by the resultant electric feild produced. This effect was demonstrated on a recent episode of the Discovery Channels' MythBusters in which an electronic levetation machine purchased on the internet was found to produce "wind" due to the movement of charged particles. The cool levetation trick observed when the MythBusters plugged in the electronic ionizer demonstrated that moving ions can produce thrust; however, this "ionic breeze" is quite weak and certainly when employed by a room air cleaner is not sufficiently powerful enough to produce the needed air changes per hour, which is by far one of the most important variables of an efficient room air cleaner. As one popular underperformer says, "to clean air, you've got to move air". INDEED! There are some electronic air purifiers that contain extra HEPA air filters (HEPA filters are highly recommended) or special Electrete filters which use charged filter media to capture pollutants. These types of ionic filters are commonly used in residential air exchangers or whole house air purification systems. Electrostatic Precipitators are the type of ionic air cleaner that employ charged plates as described above. The dirtier the indoor air the faster the plates become covered with particles. Thus more frequent cleaning of the plates is needed if cigarette smoke or a lot of dust is a problem inside the home. Negative Ionizers emit negatively charged ions to precipitate soot and particles from the air. An undesirable effect of negative ion generators is observed when the airborne particles become electrostaticly attracted to curtains, walls, furniture, or floors. This is why the term "black wall syndrome" is associated with ionic air purifiers. There is another much more serious malady observed with some negative ionizers which can actually harm your health. It involves the production of Ozone gas which is an inhalation hazard commonly found in smog. 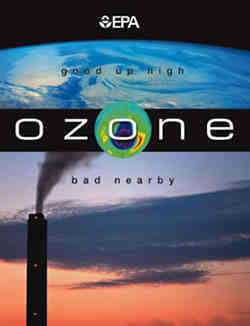 Ozone has been implicated as a major cause of asthma and can worsen allergies and irritate the respiratory tract. All ionic air purifiers produce some Ozone gas molecules as a byproduct. Some residential Ozone air cleaners (click link for an extensive list of specific models of ozone emmiting purifiers) or negative ion ozone generators intentionally produce ozone gas and have been the focus of recent actions by numerous government agencies to limit their use for protection of public health. Wizards of Oz - They're a Gas-Gas-Gas! Ozone air purification using special industrial ionic air purifiers is used by professionals in unoccupied buildings for removal of strong odors such as from smoke damage following fires. However, the intentional production of the dangerous gas by residential Ozone machines (as they are sometimes called) is a serious public health concern. The marketers in their scramble to market the better dustbunny mousetrap use Ozone (activated oxygen or superoxygen as they sometimes spin it) as a selling point and in so doing can actually hurt the health of asthmatics, allergy sufferers, or anyone who is unfortunate enough to purchase one of these unsafe appliances. IQ Air - makers of the best of the best air purifiers.